One of the titans of southwestern ecology has left us. Robert D. Ohmart passed away peacefully at his home in Chandler, Arizona on 14 January 2018 surrounded by his loving family. Dr. Ohmart’s team of field researchers conducted the seminal work that established the blueprint for habitat and wildlife needs in the Southwest. Dr. Ohmart was born in McDonald, Texas, and chose to pursue his career in the West. 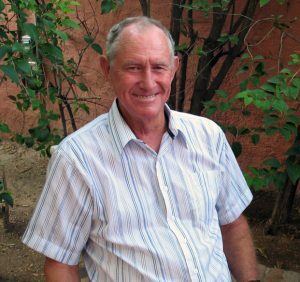 Having received his Bachelor’s (1961) and Master’s (1963) degrees in wildlife management and biology from the University of New Mexico, Bob went on the complete his Ph.D. in vertebrate zoology at the University of Arizona in 1968. After two years of a Post-Doctoral Fellowship at the University of California at Davis he was hired as Assistant Professor in the Zoology Department at Arizona State University in 1970 and achieved full Professor in 1981. Dr. Ohmart was a major force in the creation of ASU’s wildlife biology program, which was incorporated into the Applied Biological Sciences Program with a wildlife concentration located at the Polytechnic campus. He was also very much involved in the development of the Center for Environmental Studies, which became the current Julie Ann Wrigley Global Institute of Sustainability. Much of Dr. Ohmart’s research at that time helped build the early ecological research reputation of the Center. His long-term research in collaboration with Dr. Bertin Anderson, along the lower Colorado River from Davis Dam to the Mexican border, laid the foundation for understanding habitat requirements of the resident wildlife and restoring that habitat to historical conditions. He initiated similar studies along other southwestern rivers like the Rio Grande and Pecos, documenting habitat relationships of birds and other wildlife and pioneering habitat restitution. Much of what his efforts discovered led to restoration projects throughout the Southwest. From the U.S. Bureau of Reclamation, Dr. Ohmart received over $2 million in grants, which supported many students conducting field studies in Arizona during the 1970s and ‘80s. Over the years he also received funding from U.S. Bureau of Land Management, U.S. Forest Service, U.S. Fish and Wildlife Service, U.S. Army Corps of Engineers, U.S. International Boundary and Water Commission, Arizona Game and Fish Department, Lawrence Livermore Laboratory, among others. These studies produced over 100 publications and over 50 reports. Bob loved teaching. His wildlife students, both undergraduate and graduate, learned hands-on and many have gone on to careers at federal and state agencies. Topics his graduate students studied included black rails, raptors, effects of timber harvesting on birds, Abert’s squirrels, Yuma clapper rail, breeding birds in riparian habitats, cicadas, coyotes, kit foxes, cactus mice, white-winged doves, Kaibab deer and dendrochronology, burros and bighorn sheep, red squirrels, habitat use by birds in desert riparian systems, breeding bird community structure in riparian habitats, yellow-rumped warbler migration, bird communities in salt cedar and mesquite along three major river systems, secondary cavity-nesting birds, Abert’s towhees, Gila monsters, bird use of mesquite and agricultural fields along lower Colorado River, spatial composition of trees in riparian forests, riparian habitat changes, ring-tailed cats, body lipid changes of four migrant birds, bird species assemblages along a climatic gradient, desert tortoises, and reptiles in Phoenix and the sky islands. Nearly all of these students are employed in the wildlife biology field for the U.S. Fish and Wildlife Service, U.S. Forest Service, U.S. Bureau of Land Management, Arizona Game and Fish Department, Arizona State Parks, Cornell Laboratory of Ornithology, U.S. Army Corps of Engineers, and academic institutions. Dr. Ohmart was also very involved in the community and gave presentations to organizations, local schools, and senior citizen groups. His work in the conservation arena was tireless. When you see a desert nesting bald eagle or hear the “fitz-bew” call of a southwestern willow flycatcher, think “Bob Ohmart”! His role in influencing conservation for both species has been enormous. His 1980 report, “The Bald Eagle of the Southwest with Special Emphasis on the Breeding Population of Arizona,” was the first to recognize the need to consider the unique local habitat characteristics to effectively conserve the southwestern bald eagle. His many riparian publications and expert witness testimony have been the basis for several successful legal petitionings of federal agencies to protect numerous declining riparian species. Dr. Ohmart was always open to educate everyone from undergraduate students to leaders of major conservation organizations, participating in many field trips to important southwestern riparian habitats. He was critically influential in the early phases of the long-running efforts to save the San Pedro and Verde rivers, Fossil Creek, and other rare surviving desert streams. He was particularly devoted to stopping proposed reservoirs related to the Central Arizona Project, and to implementation of responsible livestock grazing in riparian habitats. In 1985 Dr. Ohmart was awarded the Thomas E. McCullough Memorial Award by the Arizona Wildlife Federation, and 2009 he was inducted into Arizona Game and Fish Department’s Outdoor Hall of Fame. He also served on the Board of Directors for the Center for Holistic Resources Management, Liberty Wildlife Rehabilitation Center, and Cooper Ornithological Society where he served as vice president. He was also president of the New Mexico-Arizona Section of the Wildlife Society. Ohmart served on advisory committees for bald eagle and southwestern willow flycatcher recovery, and was the chair of the host committee for the 103rd Meeting of the American Ornithologists’ Union held at ASU. After retiring in 2006 he focused on his love of farming. With guidance from Dan James, one of his graduate students, he shifted all energy to creating a new company called Double ”O” Enterprises. The mission was to provide a diverse blend of native Sonoran plant seed to revegetate disturbed landscapes. He was a pioneer in this field, and his success is evident as you drive along any Arizona highway. Whether at his home or his office, Bob Ohmart was always available to talk about anything under the sun. His sense of humor was sharp if not sarcastic, and always followed by his wildly expressive grin! His family roots in the oilfields of eastern New Mexico served him well, sharpening his physical and mental resolve and enabling him to talk with just about anyone. All this character development was critical for Dr. Ohmart to engage the plethora of individuals he needed to actualize his vision for restoration of native habitats in the Southwest. In-lieu of flowers, donations in his memory may be made to the Liberty Wildlife Rehabilitation Foundation (2600 E Elwood St, Phoenix, AZ 85040) or Hospice of the Valley (1510 E Flower Street Phoenix, AZ 85014). A celebration of his life will be held on January 27th, 11:00 a.m. at the Sun Valley Community Church (Tempe Campus). 6101 S. River Dr., Tempe in the chapel with a reception to follow in the social hall.